Welcome to Sad Shibow! Let’s get brooding. A couple of months ago, I decided that I wanted to try kickboxing. I loved my first class and immediately decided I was going to become a professional fighter. Then, in a recent class, I was paired with a psycho banshee who kicked me in the tailbone (among other places I would rather not reveal in a family show) and punched me in the face. Now, I literally have a kicked bottom. More specifically, I have a slipped disc, but kicked bottom makes for a better headline. My dad says that I had no business kickboxing, because I am a “lady.” Tell that to my trucker’s mouth and drum set, pops! Anyway, I’m being a total infant about this, except I’m the type of infant who, instead of whining for mommy to pick up after me, is whining for my sister Sylvia to pick up after me… while offering to repay her with brownies. I have also whined and gifted brownies to one truly awesome individual and fellow slipped-disc sufferer who drove to my place in Da Hurst to commiserate and provide remedies that have worked wonders. Special shout-out to you, dear hero. Trust me, these are so yummy that– albeit BRIEFLY– I forgot all about my hernia. Then I fell up a flight of stairs and remembered it again. I’ve always been a fan of cocoa powder. On its own, it’s quite bitter, and pretty much inedible. Still, it’ll do wonders for all things chocolate, and if you love the dark variety especially (ME! ), you’ll greatly appreciate it. Most solid chocolate, including baking chocolate, contains a fair amount of sugar that, when added to the amount of sugar called for in any old dessert recipe, could produce something a tad too sweet for some of us. 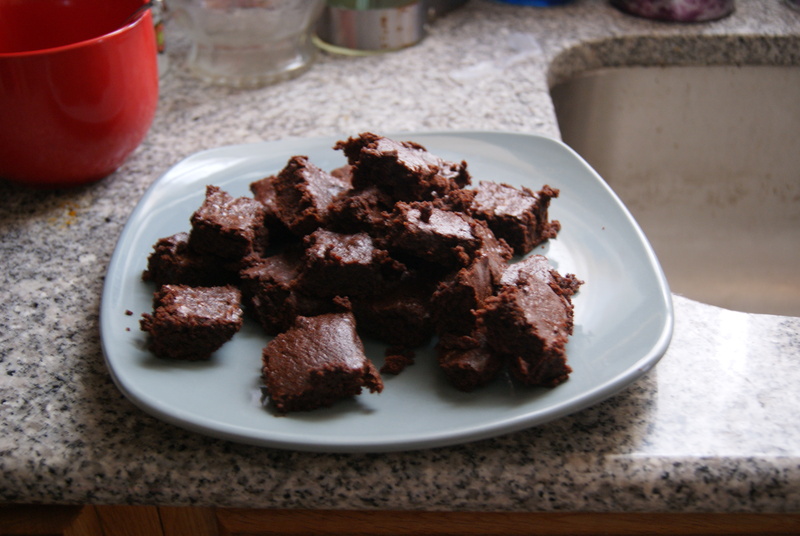 That’s why I was so thrilled to find this recipe for straight-up cocoa brownies from Smitten Kitchen. And if you’re a fan of box-mix brownies (not judging, because I know that Duncan Hines is kind of what’s up), you’ll want to listen up. Also, bust out the aluminum foil, a wooden spoon and an 8×8 baking pan. Have your oven preheated to 325° F, and line the pan with enough aluminum foil that the edges hang off two sides of the pan. Smitten says to have these cooking in the lower-third of your oven, but these came out beautifully on the middle rack of mine. 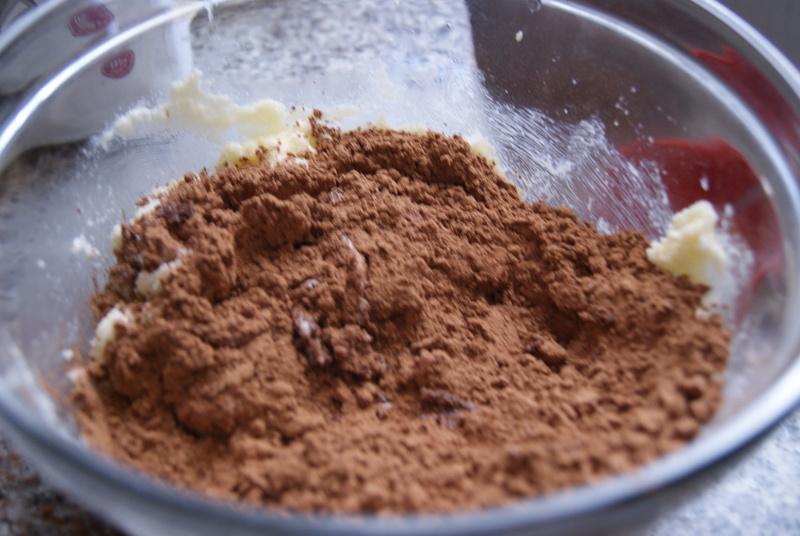 In a large microwaveable bowl, cream together the butter, sugar, cocoa powder and salt. Mix until just barely combined, then heat it in your microwave for 30 seconds. Remove, stir, and send it back for another 30 seconds. Repeat until the mixture looks a bit grainy and is hot, but not boiling, to the touch. It took me about a minute to achieve this, but if you’re microwave is not as awesome it’ll take a bit longer, so chill. With your wooden spoon, mix in the vanilla, then the eggs, one at a time. Thanks to the eggs, the mixture will start to take on a nice sheen. When everything’s fully incorporated, stir in the flour until you can no longer see it, and then begin to beat the bleep out of it. Forty strokes is the recommended amount of lashes, for those of you who need numbers to keep you in line. 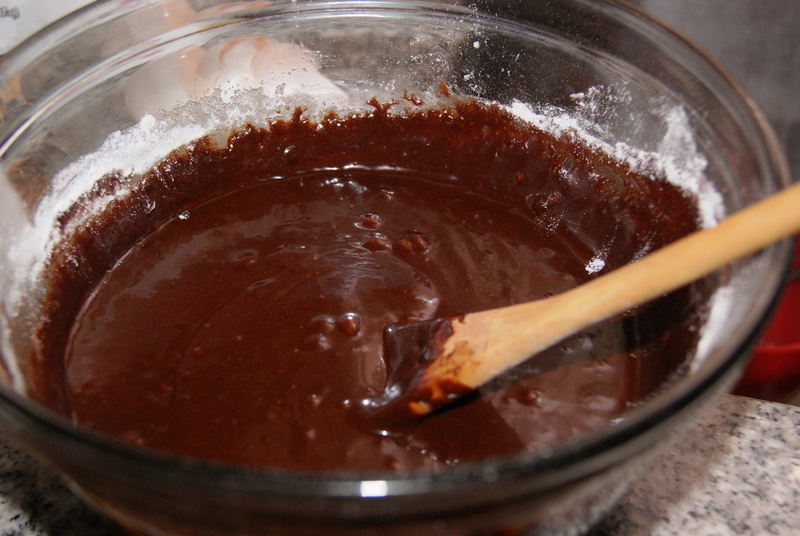 Stir in any optional ingredients, and pour it into your foil-lined pan, making sure to spread the mixture evenly. Bake the brownies until your house starts smelling like Heaven and the Oompa Loompas start slipping résumés under your door. Or, bake until a toothpick inserted into the center of the pan comes out with slightly-moist batter on it. This should take about 20 to 25 minutes (it actually took me closer to 30 minutes, so know your ovens, people). My cousin Rhea, who will be making several guest appearances on the blog and who is herself a fabulous baker, passed along a great tip: as soon as the brownies are out of the oven, stick them in the freezer for a good 20 minutes. This will allow for cleaner lines and easier cuts. 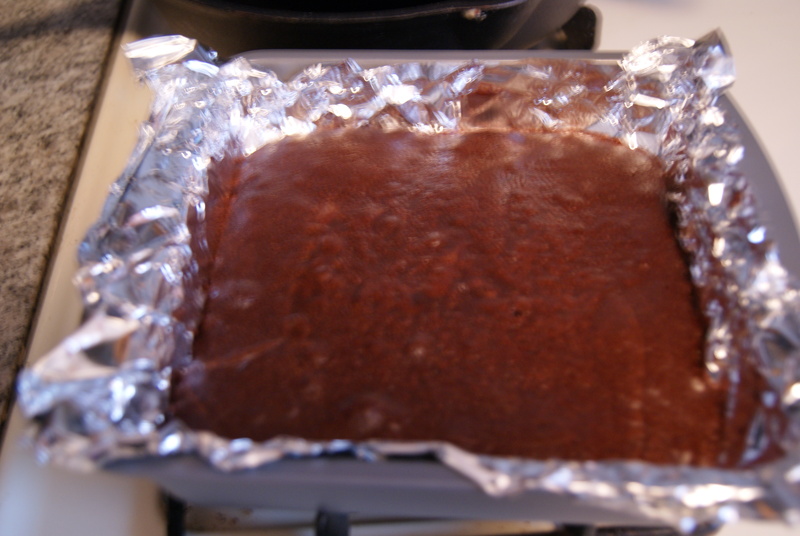 Once cooled, lift them out of the pan using the foil and transfer to a rack or cutting board to slice. As you can tell from these pictures, I did not wait the full 20 minutes. Remember what I said about being an infant? They may not be perfect squares... but neither am I! I'm just super corny. MMM just for everybody who reads this post, THESE BRIWNIES ARE AMAZINGGGGGGG!!!!! Glad you got started 🙂 They look delicious; too bad I can just see these tasty treats at the moment. I really like your writing style! It sort of emanates your character. Great job. Can’t wait for your next post! Thanks Sylvapotamus! Mel, I promise you many of these goodies upon your return to the ‘hood. And Anonymous, thanks so much for the support! That’s an interesting name…is it Greek? Anyway, I’m going to find someone to make these for me. In the meantime, I’d like to suggest something key lime-oriented in the future.